It's the beginning of March and the harbour still has lots of ice. 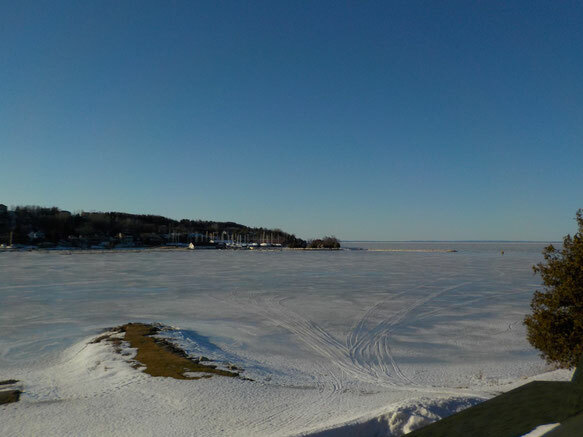 The black speck in the right of the picture is an ice fishing shack. You can see the snowmobile and ATV tracks cutting across to the other shore. Construction is ongoing here at the Inn at Gore Bay. My intention is to keep you informed of the progress. The 10 unit motel was completely gutted. All the electrical and plumbing has been completed and now the drywall contractors are hard at work. The fun part for me is picking out all the fabrics, flooring, furniture and paint colours. A dream job- I have loved to decorate since I was a young girl. I hope, when all is completed, you will be as pleased with the rooms as I believe you will be. It's a cold but sunny day today, perfect for taking pictures of the progress. Check in tomorrow for more pictures of the amazing work being done here at The Inn at Gore Bay.